Today was a beautiful sunny day in October. This morning I had two children in school and one baby that was finally taking a nap. It was time to act on a crazy idea I had last night, while watching Monday Night Football. I rummaged through all the broken and stubby pieces of sidewalk chalk to find all the purple pieces. 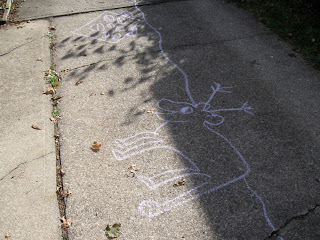 Then, starting at one end of the driveway I began drawing as Harold did on his adventure. I drew a tree and a dragon that was to protect its tasty apples. There was also the boat that saved Harold from his likely demise and a pie picnic on the beach. I couldn't forget the hill that became a mountain that held hope for Harold as he searched for his bedroom. It wasn't until after a balloon ride, a walk through the city, and a brief talk with an unhelpful policeman that I was able to draw where Harold remembered where he could find his bedroom. 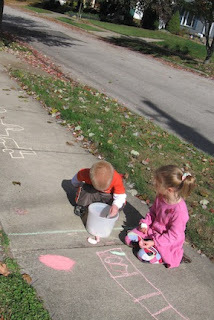 When I brought my children home from school they were surprised to see the driveway art and wondered who was responsible. I smiled and encouraged them to look at the whole driveway. Once at the end, my son said, "It's Harold and the Purple Crayon!" Later, we read the book while walking along the driveway. Back in 2007, I wrote about my experience celebrating Crockett Johnson's birthday when I was teaching fourth grade (click here to view the post). I had my students develop their own Crayon Adventures. This activity was very memorable and I wanted to revisit it with my children by drawing out the adventure on the sidewalk instead of completing the task on printed storyboards [Small Version Page 1, Small Version Page 2, Large Version.] Before we started the sidewalk drawings, I did get their creative juices flowing with a graphic organizer that I used in the classroom (download). 1. Crockett Johnson's real name was David Johnson Leisk. His childhood nickname was "Crockett". 2. Crockett Johnson was an accomplished cartoonist. His most successful comic strip was Barnaby. 3. Crockett Johnson began writing children's books after he married Ruth Krauss. 4. Maurice Sendak was mentored by Crockett Johnson and Ruth Krauss early in his career. Nel has a planned biography of Crockett Johnson and Ruth Krauss to be released in 2012. 3. HarperCollins Children's Page - Fun and Games at the bottom of page. I love your blog! As an aspiring Children's book author it's my new goal to be celebrated on your site one day! Beautifully done blog. Oh yes, I found you through Burkicos blog hop. Cheers! I love The Purple Crayon books... we have a recorded version that my kids love to listen to as they drift off to sleep. Looking at your archives it looks like there will be a lot of cool things to read on this blog. Thanks for dropping by from the blog hop. There are so many great blogs I'd otherwise not discover. Love the concept of your blog. Oh, and embarrassed to say I did not know Crockett Johnson. I do read Maurice Sendak to my daughter (much more to Where the Wild Things Are than first meets the eye) so cool he as mentored by Crockett Johnson. Have a wonderful weekend! p.s. I follow you now.